Darrell Coomes here. I have over twenty five years of experience in graphic design, art direction, photography, illustration, copywriting and marketing for regional and national business-to-business and business-to-consumer clients. Some of my higher profile clients include Insure.com andDeal Dash. My highest profile project would be designing the first Web campaign for then presidential candidate, Barack Obama. When they asked, I told them up front that I probably wouldn’t be voting for him but The seemed to like it so much they reused the design in 2012. Please allow me to help your improve your business’s image. For more, reach me by phone 270-683-4397, email or request a quote. I was again honored to serve as a Judge for the 2016 IAC Web Awards and the 2016 Mobile Web Awards by the Web Marketing Association. Seventh year in a row! 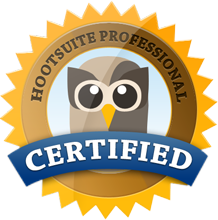 I am a Hootsuite Certified Professional, so if you need someone to handle your social media, including writing posts and creating eye-catching graphics, I can handle that, too.